Superstar (cinema, not scholarly) Angelina Jolie, nonmarital partner of Brad Pitt (also a superstar, did not go to law school), are the new parents of twins (newborn babies). Whereas this has been posted on virtually every blog, newspaper, television program, and space shuttle billboard, most academics have probably not heard about the most important world news event since the Moon Landing, the first test-tube baby, or the 1983 airing of Herman Wouk's The Winds of War. I only know about it because I might have seen a mention of it in the International Herald Tribune, or Le Monde--not in English, of course (the babies were born in France). This is such important news that the San Francisco Chronicle quelled all fears of ex-spouse jealousy with the headline "Aniston* Hopes Pitt's Twins Are Beautiful." *Jennifer Aniston, who was an actress on the situation comedy Friends, was formerly married to Pitt. They are now divorced. Aside form the fact that the biological offspring of this Celebrity Clash of the Titans generates considerable interest in what the children will actually look like once grown, there are some incredibly interesting legal issues to be learned, particularly form a family law standpoint. Although Maddox's fauxhawk, Zahara's antics, and Pax's eternal relegation to Jan Bradydom are all inherently interesting (in a middlebrow, nonacademic, non law&econ, would-never-make-it-on-NPR kind of way) Pitt-Jolie is a wonderful method for conceptualizing your fall courses or your next article submission. 1. International Adoption. Jolie adopted Maddox from Cambodia in 2002, followed by Zahara from Ethiopia in 2005, and two years later, Pax from Thailand. Jolie has expressed interest in Guatemala for future adoptions, but the country has placed a hold on international adoptions. Her first adoption from Cambodia has drawn questions about its legality, as Cambodian adoptions were halted in December 2001. 2. Blended Families. The three other Jolie-Pitt Children are biological: Shiloh, born 2006 in Namibia, and the latest twins (see Moon Landing and Wright Brothers above), born last week. Three adopted children, all from different countries, and three biological children, also from different countries. None of the children were born in the United States. 3. Transracial Adoption. With two Asian, one African, and three white children, issues of family integration, child adjustment, and cultural knowledge all hinge on the question of race. Additionally, the question of race vs. extreme privilege and celebrity provide excellent discussions. 4. Stability. 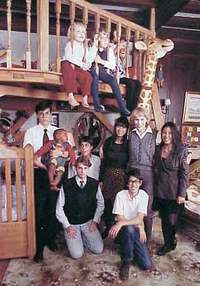 The Jolie-Pitts, in less than a few years, have lived in France, Namibia, New Orleans, New York, Los Angeles, and Berlin. Army families move often, but not usually in the same way that the J-P’s move many times in one year. For the ever-present and important concept of stability in Family Law, how would the Jolie Pitts answer this question? 5. Unmarried couples. Brad and Angelina have never married. Despite tabloid rumors predicting exotic locales, colorful napkins, and expressions of "only in marriage will I be complete," both partners have decided to remain unmarried. For purposes of adoption, inheritance, custody and dissolution, and also spousal privileges in evidence and tax, again, there are some godd discussions. 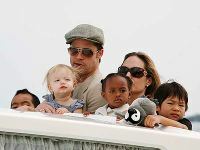 Brad, Angelina, and six children, with certainly more to come—the modern incarnation of the celebrity international megafamily. You heard it first (maybe) on the Faculty Lounge. You have a great blog. I love mid-century modern, but only own one piece so far. It is so true about that "Cocktail Hour" photo. If it was presented with other pictures of modern spaces as being current, I doubt anyone would be the wiser. this woman is sure she and megan fox are the two sexiest women on the planet to my opinion, are not that fantasies that arouse men and women.